I’m tired of biting my tongue. I’ve seen pictures like this pop up everywhere on the internet and honestly, I find it quite offensive. Here you have a wickedly lean and built sprinter/football running back compared to a frail distance runner, in this case, marathon-great Ryan Hall (and of course they choose the least flattering picture they can find). The comparison is obviously about body image and has completely nothing to do with athletic ability (running a sick marathon time vs. running a sick 40-yard time). Who would want to look like Ryan Hall anyway? Obviously no one because skinny dudes look weak. 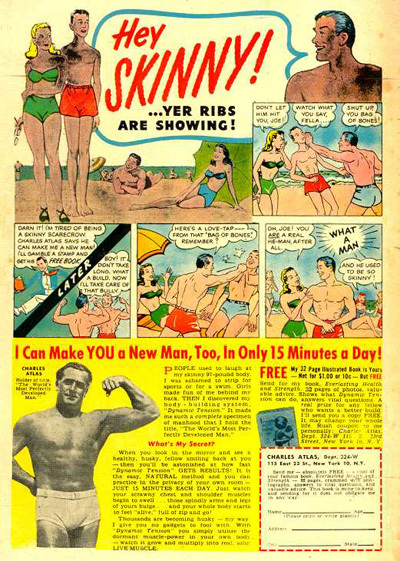 We can thank Charles Atlas for this as he was one of the first to advertise that being skinny was a bad thing in the mid 1900’s. We can thank genetics, nutrition, the training program (endurance based e.g. running vs. weight training e.g. strength training or body building) and drugs for the size and shape our muscles and body take on. According to the SAID (specific adaptation to imposed demand) Principle, you get what you train for – in the case of Ryan Hall, an amazing aerobic system and pair of lungs. On the other hand, sprinters develop high levels of strength and an amazing ability to generate force fast. Because the distance runner runs more total volume compared to the sprinter, the distance runner is in a constant state of repair with heightened levels of the stress hormone cortisol. Because of this, it’s actually quite difficult to put on additional muscle, let alone keep the existing muscle they have. Sprinters also tend to have more fast twitch muscle fibres compared to distance runners (who tend to have more slow twitch muscle fibres). This is why fast kids tend to be sprinters when they get older – sometimes you can’t choose your event – you just find out what you’re best at. Runners love running because they love to run, plain and simple. 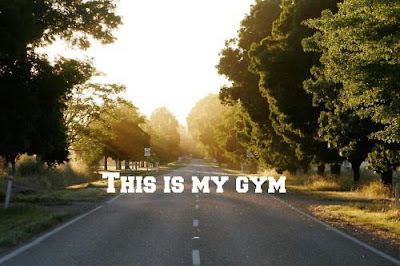 Most hate going to the gym and would rather run with a couple friends in the rain than spend 30-minutes pumping iron. They don’t mind that they don’t look like Captain America or Thor but mind setting new personal bests for their favourite race distances. 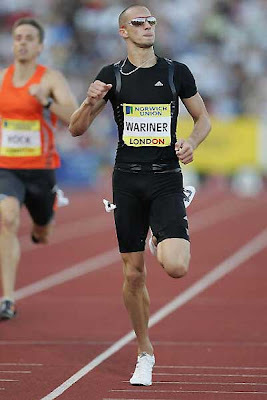 Notice how they never compare distance runners to Jeremy Warner? He’s super lean and has run the third fastest 400-m in history: 43.45. He’s a sprinter, but because of his genetics, he doesn’t look like the sprinter pictured above. Sprinting alone isn’t going to get you jacked. Is it more effective than long slow distance running at burning calories? Yes, refer to my point above. Repeated again however, if the same time frame is used e.g. 20-minutes running every other minute as hard as possible will expend more calories during and after the session vs. running the entire 20-minutes at 60% of your max heart rate. You have to remember that each type of training has its place. Many coaches advocate hill sprints, sled pushes and resistance training and body weight circuits to improve conditioning or GPP (general physical preparedness) whereas running coaches advocate running lots of miles in the off-season to build a base for the higher-intense track/road racing season. The goals of sprinters and distance runners are completely different, so stop comparing the two. If you want to run a fast 5-km, 10-km, half or full marathon, you must sacrifice you body image and get in the miles. If you want to look like the Hulk, stop running so much and hit the weights. Remember, you get what you train for. To wrap up, stop bashing distance runners because of how they look. They may look lean and weak, but they can surely run circles around you. Jonathan Edwards (GBR) pretty much debunks this post as he was stick thin. He covered the ground at 11.9m/s during his WR jump of 18.29m in Gothenburg (faster (m/s) than Carl Lewis running his personal best of 9.86secs over 100m). I’m not going to elaborate but the secret is not in the muscles, it’s in the tendons. Thanks for your comment. My inclusion of Jeremy Warner also eludes to the same “skinny” but fast and powerful idea that you’re sharing. Cheers. Unfortunately I do not think you can create a social argument for the human perception of body image. That perception was formed by evolution. Big muscles = shelter, food and security for the female monkey. I am actually a sprinter who is contemplating tackling a longer distance but my main concern is the loss of body image. You said you starting spending more time in the gym to gain muscle. My question for Jon is that is there an optimum time of how long you workout for? You typically here ppl say you shouldn’t workout for more than an hour otherwise you’ll turn into a long distance runner. But I find that professional athletes like football players train for hours a day and yet they’re pretty big. Is there any merit to the workout less than one hour a day if you want to gain? By spending more time in the gym, I meant overall – during the week. My workouts only take 45-60 minutes depending on the day. Yes – there is tons of merit to workout less than an hour if you want to gain. Most people respond well to lifting 3-4 times/week for 45-60/session. Obviously, many factors influence the best outcome possible for each person, but this is a good guideline. Thanks for your comment O Shah.